What is proficiency testing and why is it important? Solus Scientific > News > Technical Bulletins > What is proficiency testing and why is it important? When selecting a lab to carry out testing, it is important to inspect the quality management system (QMS). The QMS ensures work is consistent and is of an appropriate standard. Good labs will have ISO accreditation to prove they consistently follow set standards within the lab. These standards include sample handling protocols and daily hygiene routines. Monitoring the quality of analytical results is a requirement for ISO 15189 and ISO/IEC 17025 accreditation. One way to examine lab processes is to join a proficiency testing (PT) scheme, sometimes known as external quality assessment (EQA). PT should therefore be an integral part of any QMS. This article will explore what proficiency testing is, why it’s important and how it can help to improve the quality of results when used correctly. Proficiency testing is a way to assess the protocols in a lab and the staff that follow those protocols. There are many organisations such as Public Health England or LGC Standards that run PT schemes. Each PT scheme across the UK, Europe and the US will have its own instructions and way of handling the data collected from participants. However, each will have an administration centre where samples of known contamination levels are prepared. 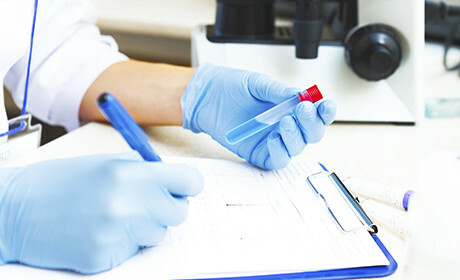 PT samples are sent to participating labs for specified testing and results are reported to the administration centre for analysis. The administration centre then collates the results and ranks participants according to their performance. All participant labs are anonymous. This anonymity allows participating labs to see trends in their own testing performance and to compare with other labs. Why should a lab participate in PT? From the data collected during PT, lab managers can identify staff that may require further training. This therefore leads to more consistent working practices throughout the lab. Regular testing also keeps the team focused on how routine procedures should be carried out. PT can provide an opportunity to further educate staff in the potential ‘danger’ areas of testing. Training allows staff to appreciate their contribution to the output quality of their lab. Staff can then also appreciate their role in the companies’ success. Lab managers can also use information gained from PT to adjust protocols if needed. For example, if a lab undergoes a rapid increase in sample numbers then results may suffer. This may only be a temporary adjustment period or it could indicate a procedural issue. If lab managers see a drop in satisfactory results across a number of rounds of testing then they can use the opportunity to re-assess protocols and formulate ways to better streamline processes. How should PT samples be processed? The normal environment for PT should be the normal environment for routine testing. Processing PT samples inside a sterilised fume cupboard whilst routine samples are processed on standard worktops is not going to provide insight into routine working practices. Any results would not be meaningful for the everyday running of the lab. Although the temptation is there to ensure the best possible results are reported, the emphasis of PT should be to ensure that all samples are processed to the best of the labs’ abilities. In order to gain the full benefits of PT, the samples must be treated like routine samples. Anyone who is trained and is regularly involved in routine testing needs to be included in PT. Individuals do not need to participate in every round of testing so a lab team may be split and groups of individuals may be rotated through a testing schedule over the year. To ensure consistency between technicians and between labs a standard operating procedure for PT sample handling needs to be created. How often should PT be done? There is no set standard for how often a lab should be involved in PT. Volume of work, other quality tools in place and number of protocols used all influence the frequency of participation. Certain schemes may recommend a minimum number of rounds over a test year in order to benefit from trend analysis. Ultimately, the lab manager must assess the needs of the lab and arrange participation in PT schemes accordingly. Why does Solus participate in PT? Here at Solus HQ, we want to know that we are producing assay kits that perform to the highest standards. By participating in PT we can ensure our kits are detecting target organisms in a ‘real world’ testing situation. We also like all of our production staff to be working at the same high level of proficiency. Solus believes that our participation in the LGC PT scheme demonstrates our commitment to quality. We believe it shows we are willing to communicate with outside companies and that we are open to feedback. If you have any further questions regarding proficiency testing or the Solus system then check out our Questions and Answers page.